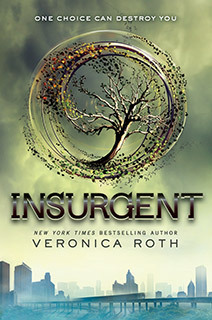 After successfully shutting down the Erudite simulation from an earlier attack, Tris, with her brother, Caleb, her boyfriend, Four, Four’s father, Marcus, and her enemy, Peter, travel to the Amity compound to seek refuge as their home, Dauntless and Abnegation is guarded by Dauntless traitors. However, the Erudite army and Dauntless traitors are present at Amity to search for the escaped Abnegation and Dauntless members. Fortunately, Tris, Four, Caleb, and their Abnegation friend, Susan, escape and leap into a train heading their way. Despite their fortunate escape, they find themselves in a cart full of armed factionless members, but they alternate their decision after Tobias reluctantly tells them his name, because he knew his supposedly dead mother is the pack’s leader. They were led to Four’s mother, Evelyn, in which Tris takes an instant dislike of her because of her abandonment of Four. Subsequently, Tobias and Tris leaves to go to the Candor headquarters. Upon their arrival, they are taken into an interrogation under a truth serum. Tris reveals, although without the serum in effect, she had killed her friend, Will, during the attack. This angers her friend and Will’s girlfriend, Christina, and Tobias because she kept her guilt from them. Following the interrogation, Dauntless traitors arrive at the Candor headquarters and shoots the people with serums that was invented by the Erudite to slowly kill them unless a Divergent is turned in. Tris, against Tobias’s will, turns herself into the Erudite headquarters. During her imprisonment in Erudite, she encounters Caleb who is working under Jeanine, and she is beyond disappointed because of his betrayal and dishonor toward their family. Peter, who is also working for Jeanine, feels indebted to Tris and saves her from her execution. They leave the Erudite headquarters to reunite with the other Dauntless members. As far as I can remember, I have not read much science fiction books. The Divergent series is most likely to be the first few science fiction books I had read. Unlike most authors, Veronica Roth, allowed important characters in the story to end their life tragically and unexpectedly. The way she displays the characteristics of each character is very unique from each other yet often relatable to most of the people we know. The main protagonist, Tris, for example, displays a caring, brave, yet stubborn personality. I can easily relate her personality to my sister because she has a caring heart but often dislikes suggestion from others. The author seem to aim the novel at a higher age level because her vocabularies are more advanced. However, her sentence structures are different from the kinds we were taught at school, and some came together like run-on sentences. The advanced vocabularies and its adolescent plot seems fit for teenagers and young adults. Overall, I would rate the book eight out of ten. 1. Why is Tris afraid to hold the gun? 1a. She had used a gun to kill her friend, Will, during an attack, and the guilt had caused her to distance herself from the gun. 2. Why did the other man inject a peace serum in Tris? 2a. Tris engaged herself in a fight with Peter in the Amity compound, and it is according to the Amity protocol to inject a peace serum to anyone who is violent. 3. What caused Tobias to be angry toward his mother’s faked death? 3a. He was angry because his mother did not think about bringing him when she left Abnegation, their former faction and home, to prevent being abused by her husband and Tobias’s father, Marcus. 4. What was Tobias’s reason to leave his faction, Abnegation to transfer to another faction, Dauntless? 4a. Tobias could not handle his father’s abusive ways and chose another faction to escape him. 5. Unaffected by the influence of the truth serum, why did Tris choose to admit she shot Will? 5a. She felt guilty for killing him and even more guilty for keeping the truth from her boyfriend and her friend, so she took the chance to spill the truth. 6. How does Tobias know that Uriah, a Dauntless born, is also a Divergent? 6a. Like Tris, Uriah’s simulation tests were ran by Tobias, so he could tell if Uriah was Divergent based on his results. 7. Why did Tobias beat Marcus in front of all the Dauntless members? 7a. Persuaded by Evelyn to have the Dauntless ally with the factionless, the poor, to overthrow Erudite and the leader, Jeanine, he decided to use that was to make him important enough to lead the Dauntless into allying themselves with and disliked faction. 8. Why did Eric request Tobis to be his executioner? 8a. He thought Tobias would live in guilt to kill his former acquaintance, but he was wrong to think that because Tobias kills him with no guilt. 9. What was Jeanine’s way to accumulate Divergents? 9a. During an earlier attack, Jeanine sent Dauntless traitors to shoot other Dauntless members with a disc connected to a serum that causes them to jump from the edge of the roof to their death. The serum does not stop the Dauntless from committing a suicide unless Divergents turn themselves in every two days to the Erudite headquarters. 10. What caused Christina to forgive Tris for shooting her boyfriend, Will? 10a. Christina finally witnessed the people under the influence of the serums. She understood Tris had to kill Will in order to save herself from being shot. 11. Of all people, why did Peter, Tris’s enemy, save her from being executed? 11a. Peter disliked being in Tris’s debt after she saved him from being shot in the Amity compound. He explains he lives in a world where people only do favors if they were indebted or desired something in return. 12. Why does Tris lie to Tobias that she does not want to participate during the attack on Erudite? 12a. Tris decides to cooperate with Tobias’s abusive father to retrieve a file her mother was searching for before her death. 13. What did Fernando name their group that was secretly sneaking into the Erudite headquarters to retrieve the file? 13a. He named them Insurgent, the title of this book because they, as a group, are acting “in opposition to the established authority, which is the meaning of the word. 14. How does Tris defeat her simulation-self to get to the door that separates her from the file? 14a. Tris realizes she and her simulation-self have different goals, and she is desperate enough to fire a gun. 15. Why is Tori desperate to kill Jeanine Matthews? 15a. She believes Jeanine was the reason for her brother, George Wu’s death during his initiation in Dauntless. How did Tris get into the Erudite compound that was guarded by the Candor?